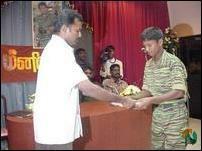 Col. Karuna, a keen musician himself, played the base guitar for the songs of the Rasikan Music Group formed by male and female troopers from the Anbarasi and Vinothan military formations, according to one of the speakers who presented the CD at the LTTE Thenaham conference centre in Karadiyanaaru, 24 kilometres northwest of Batticaloa. The following is the full text of the section of Col. Karuna’s speech at the Music CD release, which dealt with the current political turmoil in Colombo. “The current situation (in Colombo) is creating fear among our people. We have been expecting this to happen for a long time. We have warned you from the beginning that the Sri Lankan government will not grant Tamils their rights willingly. Like smashing the pot when the milk in it is churning into butter, the Sri Lankan President has sabotaged the peace process at a crucial time – at this juncture where we submitted our proposal to take forward peace talks towards fructification. No one in the world expected her to behave like this at this juncture. We prepared the proposal (ISGA) for the Interim Self Governing Authority to fulfil the political aspirations of the Tamil people. The President who expected calamities in the aftermath of our presenting the ISGA wanted to scuttle this peace process. She has acted irresponsibly. The President has precipitated instability in the south for selfish reasons. We are fighting for our peoples’ rights but Sri Lankan politicians are tussling for personal gain- exhibiting their sheer greed for power. There is nothing for us to get shocked about (the events in Colombo) if you consider our experience (with the Sinhala polity) in the past. This is how in the past they scuttled the peace process despite the concessions and compromises we made during talks with the Sri Lankan government. Some intellectuals and learned persons are accusing us, saying that we could have won our struggle if we had been more patient. Now you can see the truth about what is happening. This proves again that the Tamils have to be strong. We can protect our being as a nation only as long as we can sustain our unique military power. Governments that thought we were terrorists in the past have now understood the truth after we explained the suffering and aspirations of the Tamil people. We have to observe the political turmoil in Colombo quite soberly. As you all know our leader has made no comment on the situation– he remains judiciously silent. There is no need for us to feel agitated over anything because we are strong. Therefore we should be patient. We can be prepared to act according to the developments there (Colombo). 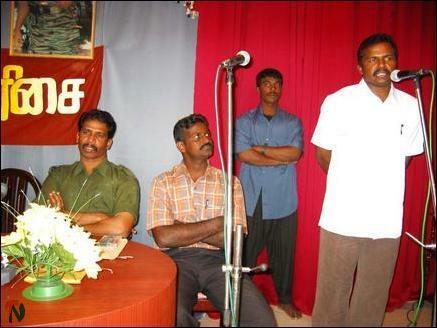 At this juncture we say one thing – all the Tamil people should be united. We can achieve our rights only if we remain united. All Tamil intellectuals and academics should come forward to join us in our political struggle, to voice our people’s concerns. I can tell you as one who took part in the discussions of the committee (that drafted the Interim Self Governing Authority proposal) that we need more academics and learned persons. Some Sinhala papers have criticized us for going beyond the federal concept in drafting the ISGA proposal. It is true that we drafted the proposal by going beyond the limits of the Federal system. 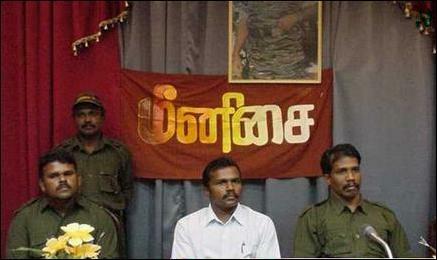 We had to do this because the Tamil people’s problem cannot be solved within the parameters of the 1978 constitution. So the Sri Lankan government has to change its constitution if it wants to do anything about (our proposal). The ISGA is not something proposed only by us. Interim arrangements like what we have proposed now have been implemented in other parts of the world in the process of resolving conflicts. Some of these arrangements have been implemented with the backing of countries like America. We carefully studied these (interim arrangements) in drawing up our ISGA proposal. We carefully argued out many issues in the proposal in manner to suit negotiations. We have told them (the Sri Lankan government) that we can discuss and examine these matters in detail when we resume negotiations. They (the Sri Lankan government) have agreed to do so. The world has welcomed that we gave the ISGA proposal. This is the first time that we have put forward a document like this. Our leader is endeavouring to win our people’s rights in many ways. We are achieving successes politically in this endeavour. Therefore we urge the people to rally round us and strengthen our leaders hands.